Skoda's newest, Yeti-replacing family member - the Karoq - will go on sale in October 2017, with prices starting at £20,875. All petrol and diesel engines are turbocharged, with power outputs ranging from 115PS to 150PS. The rival to the Nissan Qashqai will be available in three trim levels - SE, SE L and Edition. The entry-level price is more than £1500 higher than the Qashqai, although the Karoq gets 17-inch alloys, LED rear lights, rear parking sensors and a driver fatigue monitor as standard. SE L models are priced from £23,165, while the top-spec Edition trim starts at £27,110. Engines available are the 1.0 TSI and 1.5-litre TSI petrols plus the usual 1.6-litre and 2.0-litre TDI engines. Top models come with a 150PS 2.0 TDI, all-wheel drive and a DSG automatic gearbox. Safety equipment will include lane keep assist, adaptive cruise control, traffic sign recognition and auto emergency brakes, plus there is plenty of convenience technology including Android Auto and Apple CarPlay support. A wireless phone charging pad will also be offered. There are four different infotainment systems, which vary depending on the trim level chosen. The basic 6.5-inch Swing system goes without Bluetooth and DAB, but upgrading to Bolero brings an 8-inch touchscreen. Amunsden adds navigation and WiFi, along with Smartlink+. The top Columbus has a larger screen and improved WiFi, along with gesture control. In typical Skoda style there are numerous Simply Clever features, ranging from a built-in ice-scraper and a holder for pay and display tickets, to a retractable tow bar and a hands-free, electrically-operated tailgate. Luggage capacity is 521 litres with the rear seats in place, or 1810 litres with them folded. That’s a little smaller than the Volkswagen Tiguan, but larger than the Nissan Qashqai. 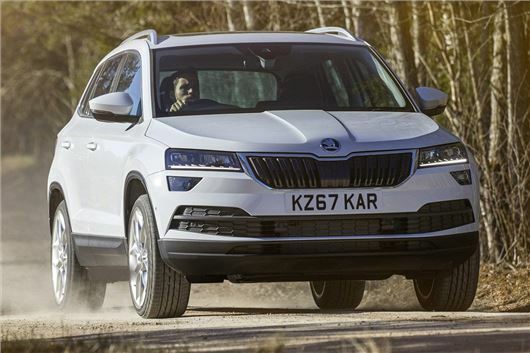 Let us know what you think to the new Skoda Karoq in the comments. Isn't anyone concerned at how frequently manufacturers are introducing huge price rises when a new / replacement model is launched? They are probably smugly slapping themselves on the back that some customers will just swallow it by concentrating on monthly payments within increasingly popular finance deals. I was seriously interested in this car but after hearing how much the base model costs they can go and do one. I think it’s a lovely car but nearly £21k starting price is ridiculous ! Nearly every we’re I read it would start about £17k ! What has happened to skoda value ? But the larger Skoda Kodiaq starts at £22,190? Without comparing base specifications it feels excessive for the Karoq to begin at nearly £21K. I was expecting the Karoq to be in line with outgoing Yeti prices (£17,770) and Seat Ateca (starting at £18,340). The Karoq is no longer on my shopping list. They have been saying for months it would start at prices comparable with the old Yeti, at this price point it is too close to the Kodiaq, so why buy the Karoq !!!!!!!!!!!! I was interested in it, but at this starting price the spec I would want 4 x4 with dsg box it will be overpriced new, will probably wait for one to come the second hand market and let someone else take the inevitable first year depreciation. Car makers are getting far too greedy with their profit margins !! Skoda used to be seen as value for money, they are rapidly losing that reputation. I have bought three Skoda's over the last 10 years and given the indicated price being comparable with the Yeti I had planned to buy a Karoq. £20k + for a car without Bluetooth is a joke. My current Skoda will be my last. In my view Rav 4 is much better and comes with a 5 year warranty for only a bit more cash. I have been a Skoda owner for the last 10 years during which I have had 2 Yetis. They are a wonderful car and I would gladly buy another were it not for the arrival of the Karoc. However I am hugely disappointed in the Karoq prices just announced. Cannot help thinking that Skoda have used the opportunity to to change the model to increase their profits. From what I have read about the Karoq it sounds like a car I would like to own but I am not prepared to pay the huge price difference. I have a Yeti Elegance and the Karoq equivalent is very expensive. I will be looking at other models now, in particular the Seat Alteca and models by Kia and Hyundai. Skoda, I feel very let down. I agree with the other comments, what happened to the value Skoda used to give. Even the VarioFlex seating,standard on the Yeti is an optional extra on the Karol. Will be looking else where this time. It looks as though new Skodas are being priced to get back some of the money that VAG have lost through Dieselgate. Maybe Seat is the new Skoda and Skoda is the new VW if that makes any sense. The Yeti was good value and still not a huge seller I dont see the Karoq as selling any better. I think that the Yeti had to die so they can sell something else for bigger profit. I'm with these guys - HOW MUCH?!?! Having had two Octavia, both were excellent, I was waiting to see the new Karoq. The price is not comparable with the outgoing Yeti and it has lost its distinctiveness. Very disappointed particularly as all the previous articles said that it would start around £17,000. I think I will take a look at the new Mazda CX5, which at least has a proper torque convertor automatic gearbox, which should be less of a reliability concern than a DSG box. On an other point. Why do all the new models have such a wide "B" pillar, this is certainly not an improvement in safety! I know it's for roll over protection but, it creates a large obstruction when I try to look to my right in particular. At 190cm, I am on the tall side, but a lot of the up and coming generation are much taller than the one before. It is interesting to note that back in 2006, Hyundai Motor and Kia Motors appointed the renowned German automobile designer Peter Schreyer (widely known for his contributions to the Audi TT) as Chief Design Officer and in December 2012, he was named as one of three presidents of the company. The transformation he has wrought since his time there has evidently transformed the company from mere 'cheap-and-cheerful' also-rans to serious contenders in the world market and they must undoubtedly be giving their Japanese counterparts plenty of sleepless nights, not to mention some stiff competition into the bargain ! With a basic Karoq starting from £20,875.00, I wish 'VW's Czech offshoot' company the very best of luck, but I reckon that they may well struggle to sell many of these vehicles both in the UK and elsewhere across continental Europe (unless heavily discounted), which admittedly seems fairly unlikely, at least in the short term. My wife & I initially considered purchasing a new Škoda Kodiaq SUV, but by the time we'd 'specced' it out with all of the desirable optional extras, we found ourselves well into £42,000.00+ territory, which quite frankly is vaguely ridiculous, even for a Škoda !!! Personally speaking, I'd advise BernieB Smith and others to look at the brilliant Kia Sportage range, because despite testing out well over a dozen alternative SUV's, including established makes such as the likes of Audi's Q5, Jaguar's F-Pace, Mercedes-Benz's GLC and Volvo's new XC60, the Sportage pretty-well makes 'mince-meat' out of the lot of them. Lest you should think I'm exaggerating a little, I recently discovered that the folks at Kia used the Range Rover Evoque as a bench-mark and having owned our beautiful *KX-5 Sportage since mid June, I can indeed confirm that imho they were absolutely spot-on ! In fact this particular *model is loaded with more additional safety features and inclusive options than you can shake a stick at and it's overall refinement and astonishing ride-comfort simply has to be experienced to be believed. The most incredible thing about all of this is that even after throwing in an amazing three years free service and a full 7-year manufacturer's warranty, we only ended up shelling-out a very reasonable £31,000.00, which even included twelve months road tax. Of course it will never happen, but I'd dearly love to see the abject expression of horror on the faces of the prestige British & German brands sales executives, were they ever forced to offer an equivalent 7-year warranty…..methinks the term 's***-scared' springs to mind !! !